In the early 1800’s a man by the name of Edward Spencer owned a newspaper company in Adamsville, Ohio. He had a niece, Melinda Spencer, who married a young man by the name of Thomas Littick. Melinda and Thomas had a son named W.O. W.O. Littick became an orphan as a young child due to his parents early and untimely death. Edward, W.O.’s great uncle, took him under his wing and showed him the ropes of the newspaper company he owned. W.O. quickly learned the newspaper business from his great uncle and decided to start a newspaper publishing company in Zanesville. W.O. began the Zanesville Publishing Company and then started a family. He had three sons Orville Beck (Bo), born in 1890, Arthur Spencer, born in 1892, and Henry Clay, born in 1893. All three boys grew up on Putnam Avenue. They were graduates of Madison Elementary School and Lash High School in Zanesville and attended Ohio Wesleyan College. As they began their professional careers their father, W.O., invited them to share in the family newspaper business. All three agreed to buy shares in the Zanesville Publishing Company and two of the three, Bo and Clay, were active in its operation. Arthur moved to Indiana where he started his own newspaper company. In 1924, Zanesville, Ohio had two newspaper companies bringing news to the people of the area. The first company, The Zanesville Publishing Company, was owned by the Littick family. This company produced the Times Recorder in the morning, The Zanesville Signal in the evening and the Times Signal on the weekend. The second company produced The Zanesville News. During this time, WALR, a 100 watt AM radio station that was owned by an outfit out of Toledo, began broadcasting on A.M 1210. WALR had studios and business offices in the 300 block of Main Street in downtown Zanesville. In 1939, WALR became available on the market and both newspapers, The Zanesville Publishing Company and The Zanesville News, began a bidding war for ownership of the station. The Zanesville Publishing Company and their attorneys, Ernest and Clarence Graham, pooled enough money to purchase the AM station and proceeded to create The Southeastern Ohio Broadcasting Company Inc. In 1939, the call letters were changed to WHIZ, the power was raised to 250 watts, the station was changed from 1210 to 1240, and the studios and business office relocated to the Lind Arcade Building on Fifth Street. The Zanesville Publishing Companies creator, W.O. Littick, passed away two years later in 1941, and left the publishing company and Broadcast Company to his sons to carry on. In 1947 a man by the name of Allan Land was hired by WHIZ and played an integral role in making what WHIZ is today. In 1950 the power was again boosted, this time to 1,000 watts. At this time, the bold move to television was being considered. Following the lift of an FCC imposed freeze on new television stations, construction began in 1952 at the Downard Road site for Zanesville’s first, and only, television station. On May 23, 1953, WHIZ-TV began broadcasting at 5:00pm on Channel 50 with just enough power to reach the 500 or so television sets in the Zanesville area. During this same year, Bo Littick passed away but not before raising a son named Bill. As a young adult, Bill started in the family business and along with, Clay Littick and Allan Land, WHIZ and the Zanesville Publishing Company moved forward. 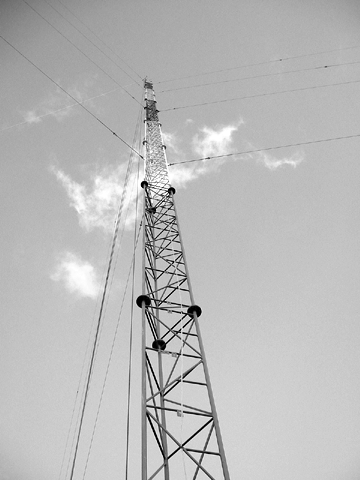 A year and a half later, WHIZ began broadcasting on channel 18 with an increase in power to 186,000 watts. In 1961 FM radio started becoming a viable medium. WHIZ-FM was established and aired on 102.5 on the FM dial with a power rating of 20,000 watts. As WHIZ became a more diverse company locally, It grew around the region as well. The Littick family expanded its media enterprises to places such as Cincinnati, Bellaire, Portsmouth, Ann Arbor, Michigan and Parkersburg, West Virginia. The purchase of these companies came with great risk considering nearly all of the stations were purchased when they were experiencing extreme financial difficulty. In 1970 WHIZ suffered a terrible loss with the passing of Bill Littick. Mr. Land and Clay Littick decided they must push forward but with a new focus. They decided to sell their stations around the region as well as the Zanesville Publishing Company and put their undivided attention on the Zanesville entities. In the 1970’s, the power of FM Radio was raised to today’s 50,000 watt stereo signal and in the 1980’s WHIZ-TV saw a new antenna, a power boost to 589,000 watts and stereo sound. In 1995, Henry (Hank) Littick began working for WHIZ. He is the fourth generation of Littick’s to work in the media industry in Zanesville. In 2000 Hank was named president Of The WHIZ Media Group when Allan Land retired after running the company for over fifty years. Today, the WHIZ stations are operating with the latest digital technology. On AM & FM radio, computer hard drives have replaced the records and CD’s that use to provide the music. Television commercials are now aired from even larger capacity computer hard drives with programming being delivered by satellite feeds instead of videotape. At the cutting edge of technology is WHIZ-DT (Digital Television). Broadcasting on Channel 40, WHIZ-DT is delivering television unlike anything seen before. High Definition television is on the horizon. WHIZ has been on the cutting edge of the media industry dating back to the time of The Zanesville Publishing Company. The company has evolved with technology as times have changed over the years. WHIZ has expanded to place itself as the leader in multi-mass media. In 1995 WHIZ purchased a Sign-Pro franchise in Zanesville, providing fast, quality signs to businesses and individuals alike. In May 2001 WHIZ acquired General Graphics, a company devoted to the creation and distribution of promotional items for various companies. WHIZ also purchased the rights to The WB network in both Zanesville and Parkersburg in 2003. In 2006 WHIZ released those rights when the WB network became the CW network. Since its inception, The WHIZ Media Group has become a multi-media company providing turnkey marketing solutions.